Things are no longer as bad as implied by this cartoon, produced for Missouri GASP back in 1993 by local artist, Paul Dillon. Almost all dining places in St. Louis City and County are now required to be smoke-free by ordinance, as of January 2, 2011. However, in adjoining counties there is still strong resistance by some in local government to provide such protections, as we’ve just seen in St. Charles County. DW reminded me of an unpleasant experience when attending a local amateur dramatic performance in which part of the action took place in a night club. At the start of every such scene most of those on-stage would light up to provide the authentic “smoke-laden air” of a night club of the period. Needless to say, it didn’t take long for that smoke to migrate to the back of the nominally smoke-free auditorium where I was sitting. j. Areas designated and posted as smoking areas by the Airport Authority of Lambert St. Louis International Airport pursuant to Section 721.045, Title VII SLCRO 1974 as amended. Sec. 13-254. Where smoking is not regulated. (a) Private residences, except when used as licensed child care facilities, adult daycare facilities, health care facilities or enclosed places of employment. (c) Twenty-five percent (25%) of hotel and motel rooms may be permanently designated as smoking rooms. (d) Retail tobacco stores that derive more than eighty percent (80%) of their total gross revenue from the sale of loose tobacco, cigarettes, cigars, pipes or other tobacco-related products, and which are not merely a department or subsection of a larger commercial establishment. Notwithstanding any other provision of this Article to the contrary, smoking shall not be prohibited in private residences, unless used as a childcare, adult day care, or health care facility. 1) That even when you have strong laws there will always be violators. 2) While we still have some way to go in that direction. without such laws things would be much worse. 1. Private residences, except when used as a licensed childcare, licensed adult day care, or licensed health care facility. 2. Not more than twenty percent (20%) of hotel and motel rooms rented to guests and designated as smoking rooms. All smoking rooms on the same floor must be contiguous and smoke from these rooms must not infiltrate into areas where smoking is prohibited under the provisions of this Ordinance. The status of rooms as smoking or nonsmoking may not be changed, except to add additional nonsmoking rooms. 3. Private clubs that have no employees, except when being used for a function to which the general public is invited; provided that smoke from such clubs does not infiltrate into areas where smoking is prohibited under the provisions of this Ordinance. This exemption shall not apply to any organization that is established for the purpose of avoiding compliance with this Ordinance. 4. Outdoor areas of places of employment. 5. Tobacco retail stores as defined by this Ordinance. 7. Bars in existence on the effective date of this ordinance in which only persons aged twenty one (21) years old or older are permitted to enter the premises, the square footage of the entire floor area of the level of the building on which the bar establishment is located is two thousand (2000) square feet or less. The square footage shall not include kitchen areas, storage areas and bathrooms. The bar shall prominently displays outside of the premises at each entrance and above the bar the following sign in lettering that is black bold Arial font at (ninety-eight) 98 point size: “WARNING : SMOKING ALLOWED HERE”. This exemption for bars shall expire five (5) years after the effective date of this ordinance. MoGASP, I know you’re not fond of my solar analogy, but I’m not now asking you about consistency. This responds to the concern about stage smoking. Have you ever been on stage? Stage lights are HOT! Air comes rushing up to the stage from the audience, gets heated, and is vented above. Concerns about the smoke from even dozens of cigarettes in such a situation battling its way outward to seek and attack audience members is a situation on a par with concerns about reflected daylight bouncing into and through north-facing windows in a Missouri restaurant and attacking diners with its carcinogenic rays. Granted, there may be a few unfortunate individuals out there with severe xeroderma pigmentosum where even such exposure is torture, but should there be a LAW requiring ALL RESTAURANTS to shutter their windows because of that? That is what those concerned about such things as stage smoking are seeking to impose upon the rest of us. Signs should be encouraged, but that’s about it. mogasp reply: Yes, I’ve been on stage, and I’ve appeared in TV studios. The latter have strong lighting but I don’t remember being bothered in either situation. That’s not been the case with SHS exposure. I fail to see the connection with other sensitivities, however. Each must be examined on its merits. On a different topic in the same post: Why this “5 year lag” for implementation? If the ban is truly not going to harm the bars economically, why not simply legally guarantee them against losses for five years with the funds being taken from antismoking groups and legislators supporting the ban? After all, if they’re telling the truth, they’ll have nothing to lose. And then there’d be no need to wait five years for the implementation. The only reason they would refuse to agree to such a thing, and thereby impose “suffering” upon their constituents and the workers by their delay, is if they were lying about the ban not posing a serious threat of harm in the first place. What say you mogasp? Would you be willing to personally sign onto such an agreement and back off on supporting a ban until the other forces behind it sign on as well (so you wouldn’t get stuck personally holding the whole tab… if it came to being)? mogasp reply: It’s a matter of public health and welfare, not economics (real or imagined). So why can’t bars/restaurants have rooms as well that allow smoking without staff being required to enter, as long as “smoke from these rooms must not infiltrate into areas where smoking is prohibited” ? After all, there’s nothing “Magickal” about hotels that make the physics of air distribution behave differently, and the law seems to recognize that such separation is possible, so why the difference? Unless there’s a lie in there someplace. mogasp comment: I personally don’t believe in making ANY exceptions, except private residences under limited circumstances (see MoGASP’s third goal). These exceptions are typical of what is currently the norm in metro St. Louis (and probably the rest of Missouri), but we’re behind the times. (1) Agreed on examining sunshine/ETS on their own merits: I believe they are equal in merit for concern. 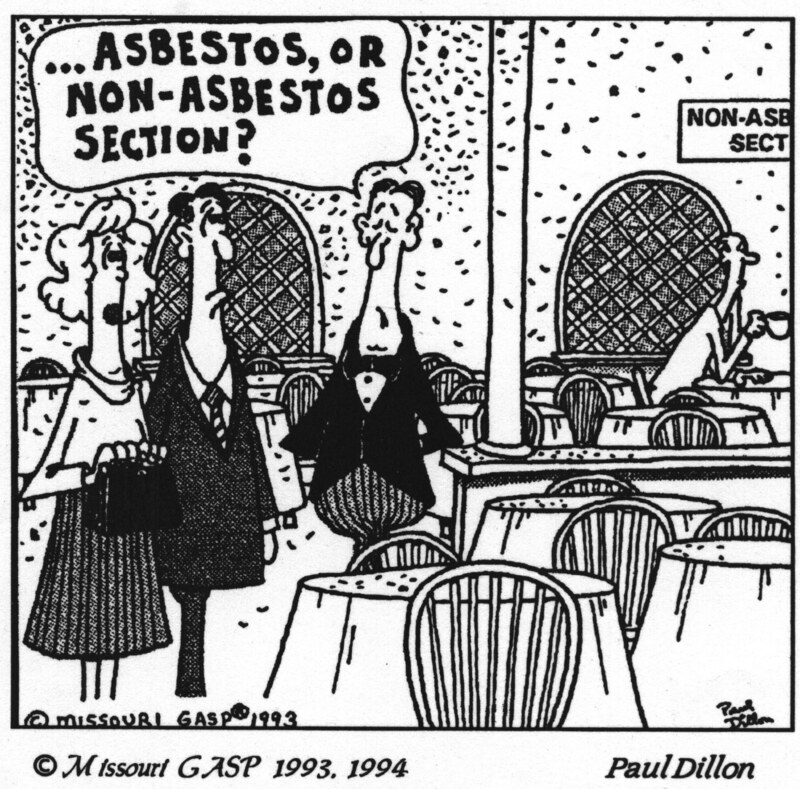 Just as for casinos and smoke, activists should warn restaurants of future employee lawsuits based on patio dining sun exposure and similar legislation imposed or not. 2) If it’s a matter of health and not economics, then why the five year delay? The economics question could be immediately eliminated with my proposed economic guarantee, so why don’t antismoking advocates move forward on the health question and provide the guarantee? MoGasp could be the first and challenge the others — thereby hastening the change. 3) I’ve always admired MoGasp’s efforts to be consistent within the ETS area, but would you then extend the push for bans to privately owned rowhouses? Smoke must assuredly “infiltrate” between such places just as it can infiltrate from one sealed apartment to another. mogasp reply: I don’t see your proposal in 2) above as realistic or helpful. Regarding 3), apartments sometimes present a reported problem because of SHS migration. I have not heard of comparable problems with townhouses. Does MOGASP support a ban on smoking in a private residence when children are present or when children live in the residence? Does MOGASP support a ban on smoking in cars when children are passengers? A society where smoking is done only between consenting adults in private. MOGASP said it’s not a matter of economics real or imagined. I’ve previously posted here that economic loss shortens life-expectancy. with links to proof. also posted that all economic studies by degreed economists and published in economics peer reviewed journals find economic loss. So the effects are real because they are much more consistant in the literature than your so-called case-controlled SHS studies… immediate economic loss is much more likely than health improvements when SHS is eliminated – and MOGASP even agrees with Doctor Siegel on my last point. mogasp reply: There are still questions over the studies by economists. There may be some debate over the immediate health improvement with SHS law implementation, e.g. as regards cardiac mortality. There is no debate, in my view, over the immediate societal benefits of smoke-free air, especially for anyone who is smoke-sensitive, asthmatics being among those topping the list. I know of no logical reason to treat SHS smoke pollution differently from other sources that are regulated. I have smoking allowed signs on all entrances to my adult’s only business. Do you want me to be responsible for forcing people to quit smoking? Is that really my job? 85% of my customers are smokers. The others want to be around their smoking friends, and that is their choice. There are lots of places in my small town for those who chose to avoid smoke to go. In fact, when one of my four hundred members said he didn’t like the smoke, I gave him the complete list of non smoking venues but he keeps CHOSING to come to my tavern. Would it help to supply the anti smokers with a complete list of every non smoking place they can drink? I would gladly do that. Sheila, It’s no more your responsibility to force smokers to quit,, than it is MOGASP’s responsibility to force smokers to quit by back-door prohibition, –that means gradually eliminating all places smokers can smoke, instead of directly outlawing tobacco use. MOGASP, do you favor making tobacco use as illegal as marijuana use??? mogasp reply: Missouri GASP takes no position on the legality of tobacco use. Speaking for myself, I think it would be insane to make tobacco use illegal, but that’s just my personal opinion. Who raises the questions about studies done by economists???? -only you antismoking pressure groups, who have a necessary need to fool people about economic loss. If you admitted the loss was real, then the health impact of lower wages would enter into the debate. I can show you an advance copy of the Lexington study which showed a 50% increase in bar closings, but the final version which appeared in Tobacco Control left that data out on purpose. There is no debate over lack of immediate health improvements due to Dr. Siegels analysis, and several comprehensive studies. Since you want smoke-free lives for kids, then I presume you support bans in homes with kids. Dave’s final question is quite legitimate MoGasp. I have not seen the sources from economists that raise questions about the economic studies done by economists in this area. Can you cite a few? Also: I don’t see why this proposal: “The economics question could be immediately eliminated with my proposed economic guarantee, so why don’t antismoking advocates move forward on the health question and provide the guarantee? MoGasp could be the first and challenge the others — thereby hastening the change.” is unrealistic. If MoGasp and other antismoking groups are confident they’re telling the truth why wouldn’t they jump at this opportunity? Also in repsonse to you, paraphrasing, “The immediate benefits of outdoor indoor dining bans, particularly for those who are sun-sensitive,” are quite clear. Such individuals would no longer be forced to choose between skin cancer and food, and would have the freedom to work where they wished. Do you think that should be denied to them? So are you then clearly stating that even if smoke in a smoking-allowed hotel room did NOT “infiltrate into areas where smoking is prohibited” that you would STILL prohibit it? If so, can you explain why? mogasp reply: You are making an assertion about SHS which I believe to be scientifically unfounded. My conclusion is based on numerous independent measurements conducted for MoGASP. If smoking occurs in a building, even if there is an attempt made to isolate it by providing separate ventilation, my experience is that SHS will diffuse from the smoking to the nominally smoke-free area. that smoking must be banned in ALL hotel rooms in St. Louis. That 20% provision must be removed if your beliefs are correct. Have you urged them to remove it on that basis? And what would your feeling be about a motel having two equally sized buildings, one smoking and one nonsmoking? Clearly there’d be no infiltration in that sort of situation, true? mogasp reply: In general, I agree with your assessment. There would be only one residual issue: that of employees having to service smoking-permitted guest rooms. Realistically, we’re a long way from that end-point though.